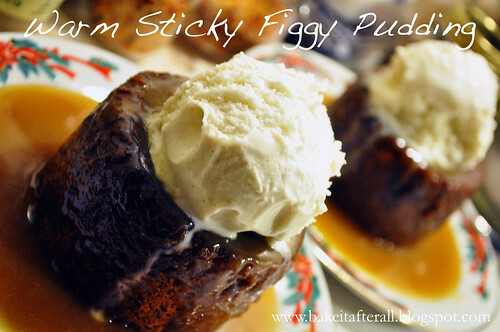 I posted this amazing recipe for Warm Sticky Figgy Pudding two years ago and promised better pictures. I was able to capture some last year so I'm revisiting the recipe today. I make this "pudding" each year for our annual "Dickens Dinner." It quickly became a hit the first year and will remain a staple on the menu. This is a very rich dessert, and I only make it once a year, but it is SO worth it. 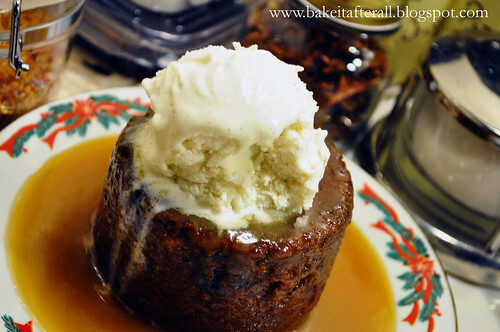 The caramel sauce is an absolute must, and really, so is the ice cream. 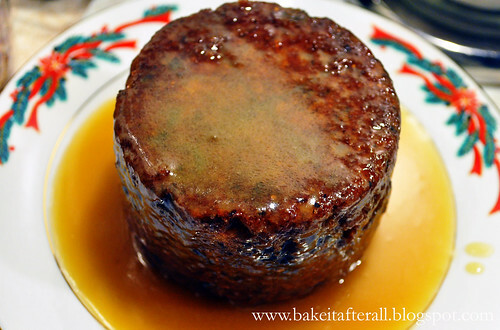 Ina Garten had a chef friend on her show once who showed her how to make Date Toffee Pudding - the recipe I use is different because it has figs and also flecks of chocolate - to use Ina's own words against her, "how bad can that be?" 1. Add the dates, dried figs, and water to medium saucepan and bring to boil over medium heat. Remove the pan from heat and stir in the baking soda. Let cool for 5 minutes, then add to a blender to puree. 2. Using a hand or stand mixer, cream the butter and sugar in a large bowl. Add the eggs and beat well. Fold in the flour, the pureed date mixture, and the chocolate. 4. Bake at 350F for 20 – 25 minutes. 5. To prepare the sauce, stir the sugar and cream in a medium saucepan over low heat. Simmer until the sugar dissolves. Raise the heat to a boil, then reduce and simmer 5 minutes. Add the butter and stir until incorporated. (I make this at home and take it to my sister's. Then I reheat the sauce prior to spooning it over the cakes). 6. Remove the ramekins from the oven and let stand for 10 minutes. Serve in the ramekin or unmold each cake onto a serving plate. 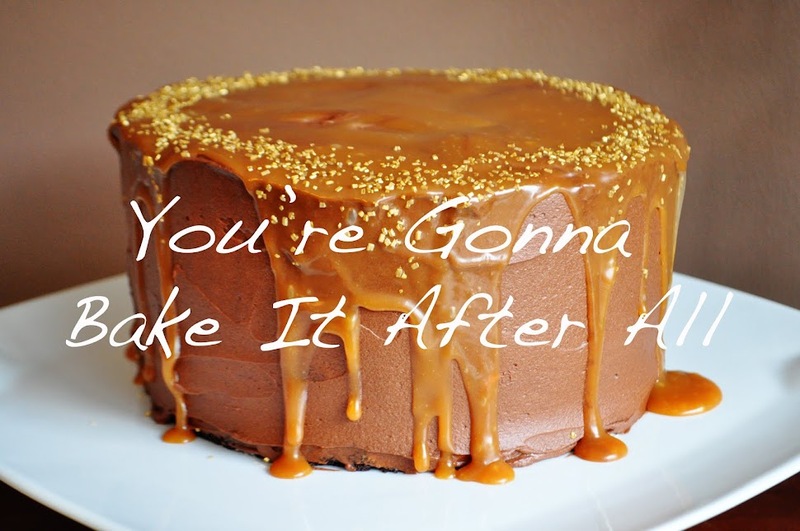 With a paring knife, cut a cross in the center of each cake. Pour the sauce over the pudding and allow it to soak in slightly, then top with more sauce as desired. How come I never get invited to the Dickens Dinner. 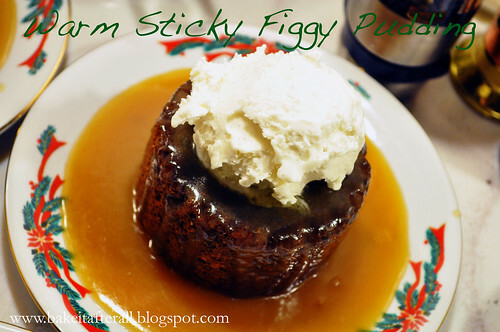 I would love to try Sticky Pudding.